A Greek style lemon and herb marinated roast leg of lamb with lemon roast potatoes that is perfect for Easter or for a special Sunday dinner. Easter is right around the corner and this last weekend I took the opportunity to test out a new recipe. When I think of Easter dinner I almost always gravitate towards lamb which reminds me of spring and I have had this recipe for a Greek style roast leg of lamb from Kalofagas bookmarked for a while now, just waiting for a special occasion. One of the things that I really like about Greek cuisine is the heavy use of fresh herbs and this roast lamb is marinated in a mixture of rosemary, thyme and oregano in addition to lemon juice, mustard, paprika and of course a generous amount of salt and pepper. After marinating the lamb is roasted until it is moist and falling apart tender and then potato wedges are tossed in the drippings along with more lemon juice and some oregano before being roasted until nice and crispy! What a meal! When roasting meat the goal is for it to be moist and tender and there are two ways to get this; the first is to roast the meat just until it hits the sweet spot at medium-rare and the second is to keep roasting well beyond well done where the bonds that hold the fibers of the meat start to loosen and the fat starts to render returning the meat to a moist and tender state. A lot of the time when you roast lamb, you go for the sweet spot at medium rare where the lamb in really pink and this recipe is not one of those recipes; here we roast it until it is so tender that you can cut it with a spoon. In addition to the amazing lamb this recipe also calls for using the lamb drippings to roast some potato wedges in and they might just be better than the lamb itself! The potato wedges are tossed in lemon and oregano and they are roasted at a high temperature until they a crispy on the outside and pillowy soft on the inside. With the combination of the flavour provided by the dripping, lemon and oregano and the textures, these potato wedges are almost impossible to resist! Although roast diners are always good, I sometimes enjoy using the leftovers even more so I often get larger cuts of meat than needed planning to get lots of leftovers! 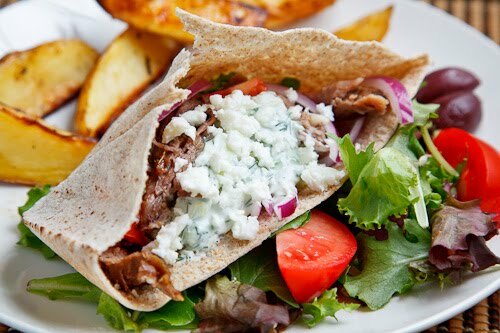 I kicked off using the lamb leftovers this morning by making some roast lamb gyros, with tomatoes, onion, tzatziki and feta for breakfast and I served them with some of the leftover roast potato wedges and a salad. Mix the remaining garlic, oregano, rosemary, thyme, the juice and zest of 1 lemon, the oil, mustard, paprika, salt and pepper, rub the mixture over the lamb and let it marinade in the fridge for 1 hour to over night. Place the lamb on a rack in your roasting pan, top it with some of the marinade and place enough water in the pan to cover the bottom without touching the lamb. Cover in foil and roast in a preheated 450F/230C oven on the middle rack until tender enough to easily pull from the bone, about 2-4 hours, adding more water if needed. Reduce the heat to 350F/180C and roast until browned, remove from the oven cover in foil and let rest. Remove the drippings from the pan reserving them. Skim off a few tablespoons of the fat from the drippings and toss the potato wedges in them along with the juice of one lemon, oregano, salt and pepper to taste. Cut the remaining lemons into wedges, add them to the pan along with the potato wedges and roast at 450F/230C until the potatoes are tender on the inside and slightly crispy on the outside, about 30-45 minutes. I have never thought to roast a lamb like this – we are always going for the medium rare state. This sounds delightful and I love the gyro…what a great way to use the leftovers! We always roast our leg of lamb with carrots and potatoes and I agree that they are just wonderful! This. Looks. AMAZING. I am seriously blown away by all your recipes! Mighty scrumptious! This easter I'm making schawarma lamb and will use the leftover to make Lebanese rolls. Great looking leg of lamb Kevin. This is the Greek way to do a leg of lamb…well done but still succulent & fall-off the bone. Cheers! I love lamb done the greek way! It brings out all the flavours of the roast and marries them beautifully. I'm already drooling and I have a roast lamb in my freezer! 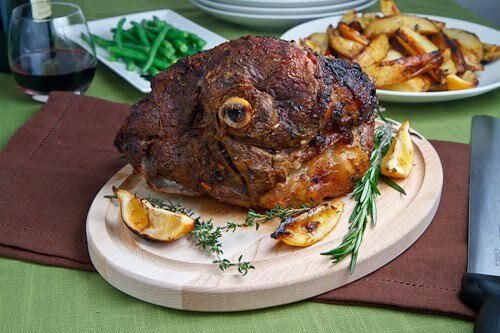 I never really make big roasts like this, but with Easter coming up this weekend, I might have a good excuse : ) looks delicious! I'm confused (easily done) about step 4 & 5 – preheat to 450 and roast for 2-4 hours…after that reduce to 350? Or reduce to 350 as soon as you put the lamb in? Thanks for any info…looks amazing. I've already purchased a boneless NZ leg of lamb – what do you suggest I cut the cooking time down to? Lillian: I wanted to ensure that these potatoes came out nice and crispy so I did not want them submerged in liquid. I do enjoy roasting potatoes in the pot with the meat though and next time I will have to try adding sprite! jillian: I was intimidated by roasts at first as well but it is actually quite easy. With roasted where you are going for medium rare, a thermometer is your best friend and for roasts like this you just keep cooking until they are fork render keeping an eye on them as they go. Julia: You want to cook the lamb until it is comes away easily with a fork so just start checking for it to be done a little earlier, say at an hour and a half. Anonymous: You roast it covered in foil at 450F until it is done and then you reduce the temperature to 350F, remove the foil and roast it a little longer to give it that nice colour. This kind of looks like Admiral Ackbar's head on a platter. Delicious recipe! I made this tonight for dinner, served with eggplant and mashed potatoes. We also made a gravy from the drippings. A keeper for sure! I roasted mine at 450 for the first 15 minutes. The leg cooked 25 mins/lb. Thanks for the great recipe! Wow very delicious lamb recipe you got there… cant wait to try it .. thanks for sharing .. I have one oven and am hosting a big dinner — 17 people. I have 2 legs of lamb, bone-in, each approx 3 pounds. I also plan to bake salmon (20 minutes cooking time). Questions: 1) If I cook both legs of lamb at the same time in the oven, do I have to extend the cooking time? 2) Do you think it is a good idea to start cooking the salmon as soon as the lamb is done, so that both can be served warm? Or would you suggest a different method? Thanks much. bBarb: The roasting time should not change all that much for the lamb and putting the salmon in just after the lamb is the way to go. It sounds like it is going to be a great meal! Hello Kevin, cooked this this evening and i think i overcooked the lamb. The marinade was great and the flavour of the meeat fabulous, but it was abit dry. Very tender but dry, we usually have our lamb very pink. I had a 4 lb bit of meat and cooked for 3 hours, usually I would have cooked for 2hours. any suggestions.? Anonymous: There are two sweet spots when roasting meat where the meat is nice and tender; the first spot is when the meat is medium rare and the second spot is when the meat has been roasted long enough that the muscle tissue starts to break down and the meat gets tender again. This recipe is going for the second sweet spot where it is roasted long enough for the meat to get really tender but is should not dry out. Did all of the water in the bottom of the pan evaporate? One thing that you can do to help keep it moister is to cover the roast in foil while it roasts. Martha: Yes, you cook the lamb until fork tender, about 2 hours and then roast the potatoes for 30-45 minutes. You could also add the potatoes to the pan with the lamb about 30-45 minutes before it is done and cut down on the total time. I just made this with Australian bone-in lamb shoulder. It was amazing! The meat is fall-off-the-bone and still a little pink inside. I think the shoulder was about +2 lbs. I roasted it for 2 hours. I didn't even end up crusting up the outside. No need, and I didn't want to risk drying out the meat. I accidentally left out the dijon mustard, but it was still deelish! I also used dried herbs, as I didn't have fresh. The recipe is awesome! Thanks a million for posting. My 20 month old keeps saying, "More lamb! Oh, goodie!" Just made this, slight variation used smoked paprika and made accompanying sauce of mint, dill, cayenne, shallots, lemon and yoghurt, absolutely perfect. Cooked for nearly 4 hours until the bone literally slid right out. Fantastic recipe, best lamb ever! A lovely recipe with a surprising and fresh taste of lemon. A great pairing. I make sure to add extra potatoes. Thank you for posting this. thank you for sharing,the herbs used are fresh or dried? Youmen Salam: I use fresh herbs in the recipe but dried would work (but not quite be the same) if you preferred. Hi Kevin, would it be possible to adapt this for a crock pot? emilyrichardson: Yes you can! You can implement steps 1 & 2, place the lamb in the slow cooker, top with potatoes cut into 2 inch pieces along with the lemon wedges and cook on low for 8-10 hours or on high for 4-6 hours. If you want the crispy potato wedges you are going to have to do them in the oven so you would just place the lamb in the crock pot and then implement steps 7 & 8. Hands down the best lamb recipe I’ve ever made…I won’t even order lamb in a restaurant anymore, mine is so much better. I actually print the recipe out every time I make it because at least one person will ask for it. I do mine in a rotisserie, but I know its really good in the oven especially when you use the convection option. Thanks so much for making me look like a professional chef! !